How you price your services has a big impact on your profits. In our latest guide, we’ll share 10 advanced pricing approaches you can use to maximize your profitability. Pricing agency services used to be rather straightforward. Agencies would figure out how much each employee costs on an hourly basis. Then they’d add their margins, operational costs, and bill customers by the hour. That’s still the dominant pricing model for agencies (especially creative agencies). But the internet, and the transparency it engenders, has changed things somewhat. A growing number of agencies are adopting new pricing tactics - fixed-fee, performance-based, retainer-based, etc. Then there are your non-agency competitors - startups focused on solving niche-specific problems. Some of these, such as Scripted (content) and 99Designs (design), use transparent pricing as a key selling tactic. How should you price your services to maximize profitability in this environment? What are your peers doing? And what tactics can you adopt to extract additional profits? I’ll answer these questions - and more - in this article. Selling agency services is inherently comparative in nature. A client will often invite proposals from several agencies as part of any RFP process. Understanding how your competitors price their services can be a valuable exercise. Small tactics - disclosing prices upfront, asking for budget details, etc. - can have a big impact on profitability. We conducted a small survey of creative, digital, and marketing agencies to figure out what pricing tactics they were using on their websites. Creative agencies, including advertising, design, and branding agencies. Digital marketing agencies, including full-service, development and general-purpose design agencies. PPC/SEO agencies that focus on search engine marketing. Inbound/Content/Social agencies that offer content creation, inbound marketing, and social media services. We then looked at whether these agencies had transparent pricing or not. Unsurprisingly, transparent pricing wasn’t a thing for most agencies, with only 9 out of 122 declaring their prices upfront. Digging by category, we found that SEO/PPC agencies are the most likely to declare prices upfront, and that none of the creative agencies on our list share prices. We then looked at how many agencies used a contact form vs. offered a email address. This might not sound like an issue, but the casualness of an email conversation (as opposed to the stiff formality of a contact form) impacts relationships. We found that creative agencies often preferred using email addresses over contact forms. For SEO/PPC agencies, the opposite is true. You can easily attribute this to the more wide-ranging relationship creative agencies have (or rather, want) with their clients. In contrast, SEO work is more procedural, and hence, fits the tighter constraints of a contact form. How agencies design their forms is also important (though overlooked). Asking for a budget in the form, for example, pigeonholes you into a particular price range. At the same time, knowing the client’s budget upfront can make the sales process easier. Once again, SEO/PPC agencies were more likely to ask for a budget upfront. One way agencies sell their services is to offer free consultations and audits. This gets you a foot in the door, though it can often waste your time if you get a lot of untargeted leads. After studying these 122 agencies, we found that creative agencies are very unlikely (if at all) to offer free consultations or calls. Among SEO/PPC agencies, however, this seems almost like a standard practice. An upfront consultation can have lasting impact on your relationship with a client. You often have limited data going into a free consultation call. You might not know the client’s budget, size, and long-term ambitions. As a result, you can sometimes end up underselling your services and limiting your profitability with a free consultation. Another aspect of sales is using live chat to talk to potential clients while they’re browsing your site. This isn’t related to pricing, of course, but it can help sales-focused agencies to close more deals. Creative agencies seldom use live chat. Digital marketing agencies, on the other hand, are substantially more likely to use this sales tool. Live chat can be a powerful sales tool. As I’ll share later, it can also impact your profitability. Although the sample size wasn’t large enough to draw wide-ranging conclusions, we did learn a few things from this survey. Sharing prices upfront is a rare practice. For agencies that focus on procedural work however, it can be a strong sales tactic. Asking for a budget upfront is most prevalent in SEO/PPC agencies. Creative agencies rarely, if ever, ask for your budget in their contact forms. Creative agencies are also less likely to use contact forms on their websites. Instead, most prefer to share their emails for a more conversational approach to relationship-building. Creative agencies prefer not to offer free consultations. For SEO/PPC agencies, however, free consultations and audits are a standard practice. Keep these in mind when you’re selling your services. If you’re a PPC/SEO agency, for instance, you can weigh the pros and cons of offering a free SEO audit. You might spend more time servicing them, but you’ll also get more leads. In the next section, I’ll discuss 10 pricing tactics you can use to maximize your agency’s profitability. Pricing is the all-important ingredient in agency success. It not only affects your margins, but also that crucial component: cash flow. At the same time, pricing can be a marketing tool. If all your competitors are charging by the hour, adopting a transparent, flat pricing structure can help you stand out. There are a number of things you can do to increase your profitability. Some of these have to do with the way you sell your services, some with your ability to justify charging higher rates. The agency business has always been maligned by an inability to track its performance. The problem used to be structural in nature. If you were putting up billboards all over the city, there was no easy way to figure out which ones were driving footfalls to a store. On the internet, the problem is mostly procedural. Despite all the analytics tools available to them, agencies often struggle to track their results. In CMI’s annual survey of B2B content marketers, for instance, 47% of respondents said that they don’t track their ROI at all. The problem is particularly acute in case of top-of-the-funnel and creative campaigns. It’s not always possible to attribute a sale to a Twitter post or affix a dollar value to a rebranding campaign. You might be wondering: how does proving ROI impact my profitability? More clients: Being able to prove ROI will help you land better clients, faster. It’s easy to sell your services when you can confidently say that you will get clients a 500% ROI. Better pricing: If you can affix a ROI figure to your campaigns, you can justify charging a higher price. Clients won’t balk at a $100,000 campaign if you can prove that it can land them $500,000 in new business. Being able to track ROI also opens up the possibility of using alternative pricing models such as value or performance-based pricing. As we saw earlier, a small but significant proportion of agencies ask for a budget in their contact forms. Is this really a good practice if your goal is to maximize profitability? The answer isn’t always clear. On the one hand, you will waste less time pursuing irrelevant leads. On the other hand, you will lock in your leads into a budget range before you’ve even had a chance to talk to them. Prospects stand to gain little by sharing accurate details about their budget with you. Most of the time, they don’t even know what their budget should be. Even if they do have a figure in mind, they often have no idea of the potential ROI of the project. Force them to share the budget upfront and you’ll end up selling them on the cost of the project, rather than the ROI. What is the upside of investing in this solution - financially, personally, organizationally? What would be a “good” result for you? What would be an “exceptional” result? What are you currently spending to solve this problem? This sideways approach will give you a better idea of the client’s expectations and goals. If they’ve spent $10,000 previously and saw a 10% ROI, they might be comfortable spending $50,000 for a 50% ROI. Moreover, conversing about the budget - as opposed to asking them to select from a drop-down menu - makes it possible to sell on value instead of price. Since you’re not locked into a budget range, you have more flexibility in pricing as well. As an agency, you offer a range of services. Some of these are complex, subjective, and require a handheld approach. Others are smaller, simpler, and can be scaled. “Productizing” the latter can unlock the doors to enhanced profits and revenue. To “productize” something is to essentially bundle it up and attach a fixed price to it. You sell it on the strength of its features rather than the benefits or ROI. Clients purchase it as they would purchase a software. For example, here’s the pricing page for logo design services from 99Designs. Notice that the pricing tables look a lot like what you would find on a SaaS tool website. Does this approach lead to better client results? Debatable. But a client who buys a productized service wants the speed and transparency over the handheld, white glove service of a full-fledged agency. Productization removes much of the friction from the buying process. There are no conventional sales talks, RFPs, or kickoff meetings. Clients buy by clicking a button. You deliver the solution over email or a PM software. Since prices and features are listed upfront, there is less sales friction. The sales cycle is significantly shorter since the solution is simpler and standardized. You can standardize the creation and delivery process to scale easily. A productized service can be turned into a monthly subscription, bringing in guaranteed revenue. There are plenty of downsides too, of course. For one, you charge the same rate regardless of the client. A Fortune 500 company pays the same rate as a tiny startup. This limits your ability to extract higher profits from bigger clients. Productizing a service can negatively impact your brand as well. A large business that wants a complex solution might stay away from you if they start associating your brand with simpler, cheaper services. One way to avoid cannibalizing your own brand is to offer the productized service as a sub-brand of your agency. Bottlerocket Creative does this with WPTheory that offers custom WordPress installations. Of course, productizing services isn’t for everyone. Smaller agencies that create a lot of small, repeatable services will do best with it. Did you notice that all these factors are based on how things affect you? At no point is there a consideration for the results or value you can offer your clients. This time/effort-focused pricing locks you into a cycle where you’re constantly fighting off out-of-scope work and challenges from competitors. If it costs you 4 hours to produce a blog post and a competitor can do it in 3, what incentive does the client really have to stick with you? The solution to this problem is to focus on something your competitors can’t readily offer: results. Shifting from cost-based pricing to value-based pricing can yield happier clients and more profitable agencies. Since your price isn’t tied to your effort, you can charge substantially higher rates as long as it exceeds (by an acceptable margin) the value you provide. If you’re going to use this approach, it is crucial that you understand a client’s customer lifetime value (CLTV) and current marketing cost of acquisition (M-CAC). If you can increase the former and reduce the latter, you’re providing value. The magnitude of this difference would define your price. Implementing value-based pricing is a complex exercise that’s beyond the scope of this article. For a primer, refer to this presentation by HubSpot. The profit margin on every service isn’t the same. It’s not even unusual for agencies to lose money on one service and makeup for it on another. In the traditional ad agency model, for instance, agencies make marginal profits (if any) on creative services. Their big profit center is the commission they earn on media placements. Your pricing strategy should take this into account. You should know the cost (in time, materials) of each service and the revenue you expect to earn from it. Any service that has a low cost and high revenue should be your primary profit driver. At the same time, consider any closely related services that don’t make a lot of profits but attract customers. Try selling these services for cheap (even for a loss). Consider it as a part of your client acquisition costs. For example, we saw earlier that a number of SEO agencies offer free consultation calls and SEO audits. These agencies don’t make any profits on these audits. Rather, they use them to get a foot in the door and sell more profitable services later. Having all your project and financial data in one place can make it much easier to spot these major profit centers. Workamajig, for example, gives you a single-window view into every aspect of your agency. This can help you figure out which services to sell cheaply, which to upsell. Workamajig helps you forecast revenue and profitability from every project. Pricing isn’t just a function of market forces. It is also inherently psychological. How much people are willing to give away for a service often depends on how they feel about the service. A major pricing blunder you can make is to create a disconnect between your prices and your value proposition. For example, if your value proposition is “operational efficiency”, clients will expect lower prices. After all, you’re offering decent quality delivered quickly. Clients are psychologically conditioned to equate “speed” with “efficiency”, not “quality” (just as you’d be suspicious of a fine-dining restaurant that operated as fast as a McDonald’s). Another factor is the kind of clients you’ve worked with in the past. If you’ve worked with prestigious brands like Coca-Cola and Google, clients will be more comfortable paying extra for the “prestige”. What core value do we highlight in our marketing? Does our agency brand align with our value proposition? Does our agency brand, client history, and marketing approach justify our prices? If you’re asking for premium prices, make sure that your brand and value proposition are premium as well. “Elasticity” is a measure of a customer or client’s sensitivity to a chance in a variable. “Pricing Elasticity”, as you guessed it, is the client’s sensitivity to a change in pricing. In a market with a large number of competitors and low switching costs, you’ll have high client elasticity. A small change in pricing can cause a client to leave you for a competitor. Some agency services are inherently elastic. If you’re only producing social media content for a client, neither you nor the client have invested heavily in the relationship. On the other hand, if you’re developing a complete new software tool for a client, you’ve likely already invested hundreds of hours into the project. Switching over will have a high cost for the client. If you were to increase prices for additional services, the client will be much less likely to leave. Keep this in mind when you decide prices for your agency services. If a service has a high lock-in and low elasticity, you can likely charge higher rates for it. However, if the service is commoditized, clients might not hesitate to switch over if you stretch the prices. Revolutionary, i.e. products that change the way people think about an entire category (example: the iPhone). Evolutionary, i.e. products that offer incremental improvements over existing products (example: Samsung Galaxy S series phones). Me-too, i.e. products that don’t offer anything radically new or better than existing products (example: most cheap Android phones). These categories define the product’s “launch position”. How much freedom you have in your pricing depends on which category your product falls into. A revolutionary product has a wide gap between its ceiling and floor prices. An evolutionary product can’t charge substantially higher than its predecessors. And a me-too product has to be priced the same or lower than its competitors to survive. Agency services, of course, aren’t products. It’s not always possible to tell which of these three categories your agency would fall into (of course, we’d all like to believe we’re revolutionary). But having said that, the collection of your tools, approaches, quality and brand can place you into different buckets - at least psychologically. Are you using a powerful in-house tool to run your creative campaigns? Did you pioneer a new project management best practice? Does your agency frequently get name dropped in NYTimes? If yes, you can reasonably call yourself a “revolutionary” agency. This would mean that your pricing ceiling would be much higher than a “me-too” agency that’s simply copying what everyone else is doing. Understand what launch position you fall into. Then use it to experiment more with your prices. As Moira McCormick points out on BlackCurve, your price has the biggest impact on your profitability. Price might have the biggest impact, but it is only one aspect of profitability. Reducing your operational costs and increasing sales volume can have a significant impact on your bottomline as well. Before meddling with your pricing strategy, make sure that the rest of your agency is operating at optimum efficiency. It’s usually easier to find and remove cost centers than it is to convince clients to pay 20% more. Evaluate your current resource utilization rate and compare it against industry benchmarks (see more below). Audit your expenses. Look for expenses you can reduce or remove altogether without affecting the quality of your work. Audit your software use. Can you switch to cheaper alternatives or get a better deal from your vendor? Are there any open source tools you can use instead? Evaluate your office use. Can you hire remote workers and move to a smaller office? Invest in resource management. Analyze how many of your resources are operating at optimum efficiency. Can you do anything to help them work better (buying better tools, eliminating distractions, etc.)? Once you’ve optimized your own operations, you can consider increasing your prices. The agency business is essentially an hours-for-dollars business. If you bill by the hour (which most agencies do), your profitability depends entirely on how much work you can extract out of your resources, i.e. their utilization rate. Although it doesn’t relate to pricing, a small increase in utilization rates can have a large impact on your profitability. A designer who costs $100/hr working 40 hours/week (i..e 100% utilization) brings in $4,000/week. The same designer working at a 70% utilization rate brings in just $2,800/week - a 42% drop in revenue. For example, a survey of PR agencies found that account coordinators had a utilization rate of 81.1% in 2016. The same for EVPs was 54.7%. Generally, the higher up the seniority chain you go, the lower the utilization rate. Next, track your current utilization rate. A resource management software such as Workamajig can help a great deal. 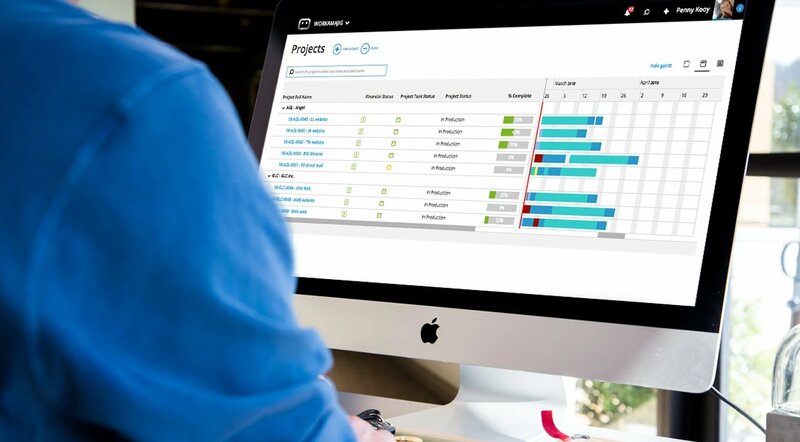 This software will tell you if your resources are spending too much time on non-billable tasks, or if your projects go constantly out of scope. Here’s a quick primer on how (and why) to invest in resource management software. Increasing your agency’s profits is a big issue. Some would say that it is the only issue that truly matters. You can’t always increase your profits overnight, but following these tactics can help. More than anything else, understanding your agency’s key metrics and getting access to the right data at the right time can help you take better, and more profitable decisions. The best way to get this data is to use a complete agency management software like Workamajig. Workamajig’s project and agency management tools will help you understand every aspect of your business and set you up for scalable growth.